In honor of D&D's 40th anniversary, I have read and reviewed the product that gave me my first exposure to D&D and fantasy in general - the module B2 - Keep on the Borderlands. B2 - Rear Cover Art. It came in the box with the 1st game of D&D I ever owned. It’s iconic and widely adored, the Ur module, written by Gary Gygax in 1980 and designed to introduce players and GMs to the game. B2- Keep on the Borderlands is likely the adventure that most home brewed adventures aspired to be in the 1980’s and certainly still informs many of the modules written today. I am not writing a comprehensive review, I’m not even going to bother declaring B2 good or bad. Instead I will do some lists – a list of key features, problems and a list of ways I’d personally run this module to make it interesting and fun. 1. Introductory Advice. The first few pages of Keep on the Borderlands give advice on running the game. Notably this is very ‘old school’ advice. For example, to aid the players rather then fudging random encounters (as advised in B5-Horror on the Hill) B2 advises sending a few NPCs (replacements? ), men at arms (cannon fodder) and lesser magical items (healing potion and weak magic items) along with the party in their expedition. This isn’t bad advice, and yet the first and second ideas still get traction as a ‘solution’ to old D&D lethality (funnels) while the last is not well regarded these days. Another nice piece of advice is the frequent admonishment to make B2 fit one’s own campaign world, to expand from it and to modify it in any way the DM wants. This is a spirit I enjoyed in B4 Lost City as well and while it might be unnecessary seeming to say, it vanishes from later TSR/Wizard’s products – even items from the mid 80’s. Advice on play and GM duties (e.g. how to play monsters - play them fully! Ham it up! Make monster noises!) is also excellent and quite applicable. 2. Points of Light. Explicit on the first page of Keep on the Borderlands is the campaign concept that is still widely popular, and maybe the real key to “D&D fantasy” in both table top and computer games. This concept is a world where order and humanity are both synonymous and limited to a few bastions surrounded by a monster haunted wilderness (or as Keep suggests – an evil nation). While my own impulse is to change this a bit, eliminating the Manichean overtones of creating a gray v. gray world rather than black v. white, the points of light in the wilderness idea is still one of the best ways to start a campaign. Now Keep seems to suggest that this is an expansion o civilization into the wilderness (Keep has a generally positive worldview I think), it seems more popular these days to have civilization fallen and a few surviving towns or regions fighting a desperate battle against encroachment. 3. A Sandbox. B2 is a sandbox. A small one (The caves are about 2 miles from the Keep, which seems like it would have presented construction problems), but a Sandbox all the same. It’s odd in that the walking movement rate is listed at 3 squares (900 feet or 2/10 mile per hour as opposed to the human preferred speed of 7392 feet, or 1.4 miles per hour) which makes for a much larger map. I’m not complaining, but this sort of odd thing that makes me like “time between nodes” wilderness mapping. Still it’s an open world with explicit encouragement that the party must ‘search’ for the caves and some cool small locations/encounters keyed on the map. 4. Monster Characterization. Monsters have strategy in the text. Keep Guards, Lizardmen, the Mad Hermit and the denizens of the caves all have battle plans (some aren’t very good – but then some of these opponents are pretty stupid), and this is excellent – giving the DM an idea of how monsters will react is very helpful. Also the Caves have actual factions! The monsters will ransom captive characters and accept surrenders! Restocking the caves is encouraged! These are great suggestions, and while the notes about them are simple, I can’t understand why this sort of thing was dropped from many later products. 5. Simple but Good Detail. Caves have excellent detail and some nice simple traps/tricks as well as evocative environments. The orc wall of trophy heads (with spy hole for orc to peer through) is an excellent example of this. The tribes of humanoids also fight fairly intelligently and come to their fellows aid within the lairs. The tribe sizes are not too large, but not especially small either. The large orc tribe for example has 23 combatants and a leader, while their weaker allies have 16 combatants. The treasure descriptions are also excellent, with concealment, and at least some bit of detail beyond being simple coinage. 1. Excessively Keep Focused. The Keep, as written loving detail is heaped on the Keep itself to almost no purpose. There are some good encounters within (the jovial, outspoken and thoroughly evil Priest planning a double cross for example, or the bank) but generally the amount of detail provided for the keep is excessive for the amount and type of adventure that the module assumes will occur within. Arguably this thoroughness is useful because it doesn’t assume the players intentions are to plunder the caves, and provides a basis for whatever else might unfold beyond an expedition the Caves of Chaos. Still, given the limited information provided about some actual adventuring locations, the detail of the Keep provides too much for too little. 2. Evil Evil Monsters. While some monsters should just be evil, predatory and hateful, humanoids especially shouldn’t always be. Yes, Keep on the Borderlands recognizes interactions with the Cave’s denizens beyond frontal assault, and suggests that the rivalries of the monsters could ultimately be used as a means of destroying the Caves. Still there is no real thought given to the possibility that a party might decide to work for one of the the monster factions. Allying with the orcs to slay the hobgoblins, protecting the kobolds in exchange for information. Monsters should attack, but since the central gorge of the Caves is basically a no-man’s land between orc and goblin it seems that both would be interested in recruiting the characters to harass, kill and spy on the other faction. Even the evil priest has a lot more to gain from recruiting the characters rather then sacrificing them to his dark lord. This problem is compounded by the silly “Different races of humanoids in different caves with better and better HP: ½ HD, 1-1 HD, 1 HD, 1+1 HD, 2HD, 3+1 HD”. 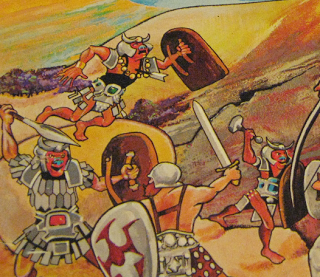 While some of the caves – especially those of the orcs and hobgoblins have fun elements, they aren’t very different and give a general feel of video game levels where the party moves from little dogmen up to ugly green guys, pig men, big ugly green guys, big dogmen and finally big ugly hairy green guys – all with the same stone cave background. Some variation in these humanoids and their lairs seems important. 3. Bad Magic. Magic items in B2 are simply awful and everywhere. Everything is +1 this and +2 that. There aren’t any interesting magical items at all, it’s all from the book. For my taste there are too many magical items generally (let’s just add a better armor – say ‘full plate’ that has an AC of 2, because there’s way too much +1 Platemail in the Keep and the Caves). Now the enemy enhancing armor and weapons can simply be replaced with better ACs and damage for monsters (it’s not a magic +1 axe, it’s just too huge for a human to use it), or evil items from the shrine of chaos, but so much of the treasure is lame magical items as well. Better a few strange wondrous feeling items then a slew of soulless mechanically beneficial crap. 4. Lame Undead. Yeah there's a Temple of Evil in the Caves, and while it's well keyed, it depends on making the zombies and skeleton's hard to turn. This is a favorite reprehensible Gygax trick. It's dumb and frustrating. Better simply increase the number of dead, or allow the evil priests to unturn/bolster undead moral with a turning roll. There are plenty of them in the shrine of evil, so the GM really doesn't need to resort to stupid amulets. This is a personal peeve in old D&D modules but it really sets a bad example here. 1. The Keep. The Keep is good, but it’s too good, too strong or too morally correct for me. I’d introduce factions, making the keep less easy to love. A fortress of a corrupt government built to protect and pacify a penal colony and hellish mine. The demesne of a decadent lord that seeks to take a good portion of treasures recovered from “his” lands as tax. The sort of environment that emphasizes that the core conflict in the world is not “good and evil” but order and chaos, or civilization (order) and wilderness (freedom). Other than playing to my personal ideology and making a darker campaign world, this scenario has the advantage of suggesting that the Keep itself might be a target of character aggression/plundering /takeover. This is helpful because it gets the players thinking about the balance of factions and the dynamics of power in the game – something that tabletop games still seem better at then computer games. An alternative to a Keep ruled by dubious forces be a Keep far less impressive and prepared to hold of the incursions of the wilderness. A half-built fortification, under garrisoned by half competent border troops that actually needs the party to protect and improve it. A place where the PCs actions are in some way heroic or necessary rather then simply mercenary plundering expeditions. 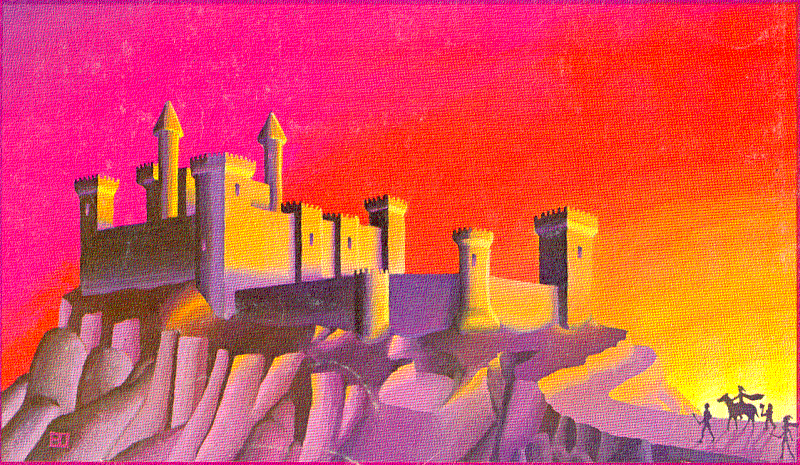 Again this allows the Keep to be used as a location for adventure – for example when it needs to be defended from the Caves’ residents, now united and enraged by the character’s incursions. 2. The Environment. Not much need for change here. The thing is too small, and I’d expand the scale, adding in a few ruins for encounters beyond the mad hermit, spiders and lizardmen. The raiders are great and I might use them to indicate a looming threat to the Keep (or a new set of allies in sacking the Keep). It’s possible that Keep on the Borderlands is ripe for a new context beyond the boring D&D medieval Europe/Tolkien that all early TSR products use. Celtic, classical Greece/Rome, Viking or ancient China would be really easy, while more exotic starting points (Perhaps a Book of Mormon inspired South America or fanciful India) would work equally well. 3. The Monsters. I’d reskin the monsters away from D&D archetypes and make them a bit less wholly evil or if wholly evil a bit more reasonable. Likely I’d replace the kobolds with classic mine kobolds – wizened little protodwarfs in rat skins (they have a giant rat farm and make rat cheese!) who want to be left alone and hate everyone else in the caves. The orcs would get a beastman sort of gloss – still orcs, but more thuggish barbarians than outright evil. I might even simply make them bands of human barbarians. The goblins and hobgoblins would need to be thoroughly reimagined as some kind of evil fey. Cruel (especially the hobgoblins who have some much torture and militarism in their lair) and alien, but willing to deal and willing to work with strong groups of humans to destroy the brutish orcs. In fact the goblins and hobgoblins would be excellent deceivers – let’s just call them elves and make the Caves a fairy mound that’s been overrun by filthy humanoids. These monsters need more goals as well – the goblins want to reclaim their fairy mound perhaps, while the kobolds want peace to mine down to some sort of horrible earth god, and the orcs want dominance and a safehold to attract more of their tribes from far away. Gnolls and assorted other big monsters would just get minor reskins (If the orcs are beastmen, the gnolls would be another variety of beastmen) as they all act as mercenaries or are largely uninvolved in the faction fight between orc and goblin (the goblin ogre would be exactly that though – a huge monster fey). The bugbears are slavers and seem best to replace with some kind of vaguely giant human so they can sometimes trade slaves with the Keep (assuming it’s not the bastion of goodness provided by the original module). 4. More detail. While there’s certainly some detail in the caves, I’d want to make certain caves more interesting by giving them some decoration. Especially the evil temple. A city of Petra style caved portico of Evil would be excellent. The caves themselves need detail as well, different stone types, levels of civilization (goblin-fey caves worked strangely with bad fairy magic and glowing mushrooms, while the orc caves are all log buttressed tunnels), and fixtures that reflect the obvious interests of the inhabitants. Magic items of course would need to be fixed, and while the mundane treasure generally has sufficient detail to be fun, some of it could be improved. In general modifying the nature of the inhabitants, giving them backstories beyond – Pig/dog/green men helps this. Orc magic items are shamanistic and totemic , while the goblin ones are all horrible fey trickery dedicated to inflicting pain or concealing. In general though Caves of Chaos deserves its reputation as an excellent introductory module, both because of the still very, very good advice it gives on running and playing a game of D&D. The adventure itself is sufficiently detailed and has some nice evocative elements, but without changes or a focus on faction and scheming, the caves may seem highly repetitive. It's pretty impressive IMO, especially for a late-era TSR product. I just skimmed it - it's not bad and lays out a nice alternative scenario that makes for a good bad (humanoid) v. badder (evil damn cult) scenario. It's a pile of 2e verbosity and mired in a very boring vanilla game world, but has definite potential - thanks for pointing it out. I like the caves with all the dead orcs that are obviously supposed to make the player's feel bad about massacre. I'm less averse than you are to the 1 and 2 issues, which have a certain nostalgic charm for me, but the suggestions made for 3 and 4 are all solid. I intend to steal them when I run this in a 40th anniversary retro session! For me '2' monster factions is the most important. Not that one needs to focus on the 'noble savage orc' but because otherwise it's likely to turn into "Beyond the next cave entrance you discover - More Humanoids!" which is painfully dumb after a while. I honestly think the bugbears are the best potential allies - they're basically murder hobos with their too clever to work plans and mercenary attitude. I've lately thought the best solution to Keep would be to have some henchman drive a large wagon of booze into the central area with a sign on it that says "Borderland Booze Delivery" and have the party hide in the woods. When the humanoids are done killing each other and nicely drunk of captured wine, it's time to sack the winner's caves. I recall Zak S. (?) commented that the point of having so much detail in the Keep (especially treasure) was that the Keep could be considered the 'true' target of the party. Coincidentally, I recently received my original books and modules, and sure enough, my B2 margin notes imply that I was prepping for a potential campaign to overcome/rob the Keep. I don't think sacking the Keep is great idea - because unless the PCs want that rare variety of orc ringworm where will they recover between adventures? I just like making my players think "are these monsters so bad in their opposition to the jerks back in town" - usually before slaughtering said monsters and taking their stuff. Ah, yes, that's the blog entry. It was just such a Zak approach that I forgot. Ha. And who says we have to play good parties anyway? I played in this a few months ago and my opinion of it worsened considerably. The maps were boring with little interconnectivity and no vertical elements plus each cave followed the same model: guardrooms, common rooms, store room followed by king's chamber with king, guards/harem, and treasure. Both the store room and king's chamber always had a door. Working one monster against the other is always discussed but almost impossible due to the language problem and the fact you can't find out information about what the monsters want without going into their caves, getting attacked, and slaughtering a bunch of them. Not exactly the best negotiating position. But the main problem was the complete lack of sense the caves made; none of the monster bothered to post look outs. If the monsters acted in any way rationally, they'd poor out of their caves in numbers as soon as the party made it to the valley. A party of low level characters would simply have no chance. It makes no sense for the monsters to just sit inside their caves waiting to be killed. B2 is a terrible example for beginning DMs. It's amazing any of us who started with it kept playing. T1 and B1 (if you fix the map) are both light years better. I don't think the map is that bad, but yes the caves could use more work - maybe if the keep was less detailed? I note most humanoid caves have no water source. The kobolds post guards, one orc den posts a lookout, and I'd presume that once on alert about outsiders the humanoids would be more careful. This leads to the united front of monsters you mention, and a need for social shennanigans. I think the GM advice is excellent in B2 as well. Why would you assume that the humanoids never leave their caves or do not respond to action in the canyon? Placement of creatures within the module is just a reasonable default starting position. Surely incautious adventurers that make a racket should reap the consequences of that choice. The humanoids all have "guardrooms" that are situated inside the caves, out of line of sight of the door. But the main issue is that if the monsters attacked in force, they could easily destroy any party of low level PCs as soon as they enter the valley, even the kobolds guards are listed simply as a distinct encounter. There is no mention of the kobolds calling for the guard who are just a few yards away. The only way this adventure works in even the slightest way is for the DM to keep the monsters inside their own rooms passively awaiting death. This used to be one of my favorite modules, but seeing it as a player totally changed my opinion. It was the first adventure I ever ran BTW. I don't think that follows at all. Why are you even assuming that the PCs and monsters are necessarily enemies? And why do you assume that the monsters would be able to work together effectively? They may not even be able to communicate (I don't remember exactly what the language situation was like). I think the faction structure makes it pretty clear that PCs should try to get on the good side of at least one group to begin with, even if they plan on betrayal at a later point. This is actually a strength of B2, because it makes kick in door/fight monsters a less viable strategy. Honestly I totally understand Hedgehobbits reservations there - that was one of my complaints about B4 - it really does indicate that the hobgoblins (and hobgoblins especially should be all military and into patrols, alarms and counterattacks) are lazy and like to wait around for death. B2, while it's true that the guardrooms are off to the side of the entrances and outdoor guards aren't generally placed (except by the kobolds) does make a point of talking about the monsters being responsive to player attack. The individual lairs all discussion group responses to incursions, and I think it's meant to be run as "you can sneak up once, and the creatures will generally stay in their holes, but once that cave is wiped out the rest of the caves are on alert. Hence the secret backdoors and faction games. The idea that the creatures just stay complacent isn't unfounded, but I think that the "how to run" section of the adventure (a major reason I like it) really discourages this without explicitly stating it. Also Yes a pitched battle between the PCs and either orcs or goblins would be hard to win (well maybe not with enough sleep spells), even with a big B/X party full of NPCs and henchmen. I think one is supposed to presume that the monsters want to avoid a costly battle with a strong adventuring party, because their enemies will jump them afterward. Now the Return to the Keep on the Borderlands takes it in an interesting direction, with the fallout of a successful raid on the caves being the increasing power of the temple, who is using necromancy and bandits to kill off the surviving humanoid factions. This is a pretty solid set up and rather interesting (especially for a 2e product). We used to take on the "The Evil Keep", sort of a Mirror Universe version of the Keep where everyone was their evil twin (or good twin in case of the jovial Priest). I've definitely spent more time running players through intrigues in the keep than I have fighting humanoids in the caves of chaos. I'm approaching the conclusion of a great run using B2, and it definitely requires some thought and an old school mindset to make it "work". I've found that the 5-pronged Holmesian alignment system is an effective cipher (chaotic evil orcish servants of the Shrine of Evil Chaos vs. original lawful evil goblinoid inhabitants). The reason that the various humanoids are holed up in their lairs is that they are tired of battling it out in the gorge below and are scheming up plots to sway the balance of power. Moreover, most hate the daylight, and the owlbear rules the night since moving in. Since the players initially cleared out the goblin and hobgoblin caverns, the majority of the caves are now filled with various orcish tribes, all summoned by the powers of the Shrine of Evil Chaos. The exploratory expeditions therefore gave way to commando-style raids, and after the owlbear was defeated there have been marauding bands of orcs roving the countryside at nightfall, becoming progressively bolder. Hence, we've got the apparent success of repeated excursions into the caves (in which there have been many character deaths, particularly at first) juxtaposed against the paradoxical consequence of more and more monsters moving into the area. The party has finally discovered the Shrine and are preparing an intricate assault to neutralize the threat. If they are successful, the orc tribes will turn upon each other, but the Caves will remain - well, Chaotic! Just love the phrase "The Owlbear Rules the Night" - Sounds well run and like a lot of fun. This sounds like an awesome way to spin B2, thank you for sharing! I will openly concede that its difficult for me to discuss B2 objectively because, like you, this was my gateway to gaming. In 1981 my uncle, all of two years older than me, asked me if I had ever heard of "Dungeons & Dragons." We rolled up a party (yes, I played all six members) and explored the Caves of Chaos. Short story: The kobolds offered little resistance. The minotaur killed us all. I took part in several other excursions. I remember well learning that sleep spells are ineffective on the waves of zombies and skeletons in the evil temple. Another TPK ended dramatically with my cleric on the business end of the EHP's snake staff. I'd guess a good four TPKs in all and I loved every second of it. As a beginner module, for beginner DMs and players, it has no equal. No other work comes close. This delivers a first and addictive dose of D&D. The wrinkles you point out are only noticed by grizzled veteran gamers like ourselves, jaded by decades of play. They are not noticed by the intended audience. I would offer that if run -as is- today for a group of newbie gamers, they would have a blast. What is also important to note that this one of a handful of the early efforts that truly foresaw the future of the hobby. This module, at its core, is a sandbox with a "node" to be explored and lots of room and hints to expand those Borderlands. One thought I had, the humanoids are not living there but rather they are visiting. I thought, a great way to put all those humanoids in one place and not have it be a total blood bath 24/7, was to have them be emissaries from their tribes, called together by the priests of the evil chapel. The idea being that the Chapel serves a much higher and more powerful being, and potentially making KotB an introduction to a longer campaign. Keeping the encounters more or less intact, one change I thought made sense is if the players leave the caves of chaos, go back to the keep and return again, the humanoids should be better prepared. Once one or two of the caves get wiped out, the others start coordinating better...making more traps...posting scouts, sentries, maybe ambushes outside of the Caves of Chaos immediate area. More importantly, they start sending for reinforcements of all sorts. Just a thought. One change I usually make is the main priest in the Chaves of Chaos to be higher level than 3rd. I usually do my best to have him escape. Nothing like a bitter enemy as a constant thorn in the players side as the story arch develops. The Cave of the Unknown is important, particularly given its proximity to the evil chapel. Are the clerics holding something back? Are they searching for something lost? Are they preparing a larger chapel area for some newer and greater enemy? Yeah all that would work, I like to keep the monsters factional (though in fewer factions). Still, a very versitile module or mini campaign. another point in favor of B2: its the only module that I ever saw that introduced me to a plethora of middle age terminology. Learning the game at about 10-12 years old, I could figure out how to edit the story/ make factions of the tribes (that was obvious) but I would of never learned all that vocabulary on my own. The cave map was flawed. There are parts where you can descend down stairs and emerge above where you entered. Much of it would be exposed to the sky because the ceiling is either going to be thin or non existant, and some is so far above the surface it would be in the air. I find verticals in D&D mapping on a 10' x 10' grid are often flawed as one is dealing with a fundamentally 2D space - or in the case of multiple levels a pancake of 2D space. Video games with 3D modelling tend to do it better, but it's often hard for players to really visualize the space anyway. In B2 it hardly seems to matter, especially with the idea that the hill heights are an issue, one need not really describe these hills in too much detail, and the largely crude passages can slope as needed. The map is functional otherwise - though admittedly not the most amazing example of mapping. I find less of a problem in its height and distance errors then I do in the limited amount of looping. It has a large number of entrances, but most lead into small linear lairs, though there is some inter-connectivity. The question for me is if small separate "modular" or "nodal" lairs are a more functional map style then the larger dungeon level where lairs and regions are part of a much more interconnected network.